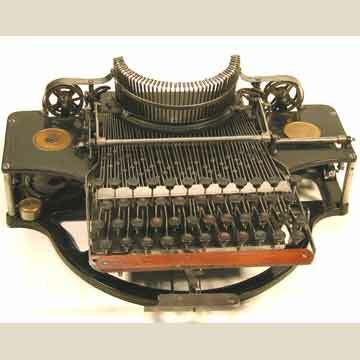 The Typograph or Cash typewriter was invented by Arthur Wise Cash of Hartford, Connecticut. The machine's most striking feature is the fact that the paper is placed on a full sized paper table and lies flat, as the type strikes down. The Typograph is such a rare machine that it was long thought that it had never been produced, but at least three of them are known. The ribbon spools of the Typograph are placed to the left and right of the vertically placed typebars. The entire typing mechanism is placed on top of the machine. The open space between the base and the mechanism holds the letter-sized paper table with enough room for it to move in all directions on rolls. The carriage return lever is located underneath the space bar. On the earlier Cash model the space bar was placed above the keyboard, making it a bit easier to reach the carriage return.